Application types supported by LSPS, all of which can be driven by business outcomes specified as goals. Business is driven by outcomes. Whether specified as strategy, success factors, performance indicators, or other descriptors, LSPS allows you to build solutions that orient themselves to achieve business outcomes as they operate. You can build standalone apps, integrated process applications, or an adaptive case management solutions, all within the same model-driven tool suite. 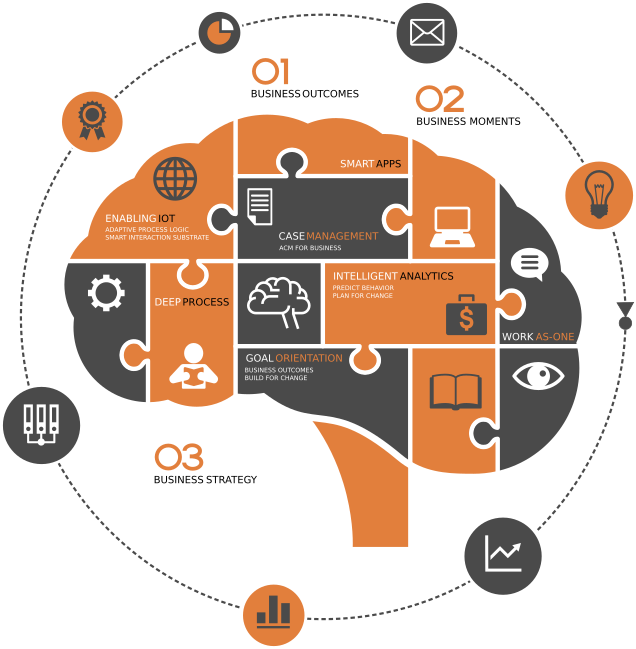 Improve process execution with a rich user interface, integrated Business Intelligence, and robust management features. A fully integrated case management system that doesn't require a complete redesign or rebuild of legacy systems. Build Rich Internet Applications (RIA’s) in a fraction of the time with LSPS’s unique blend of best-of-breed technologies and techniques. 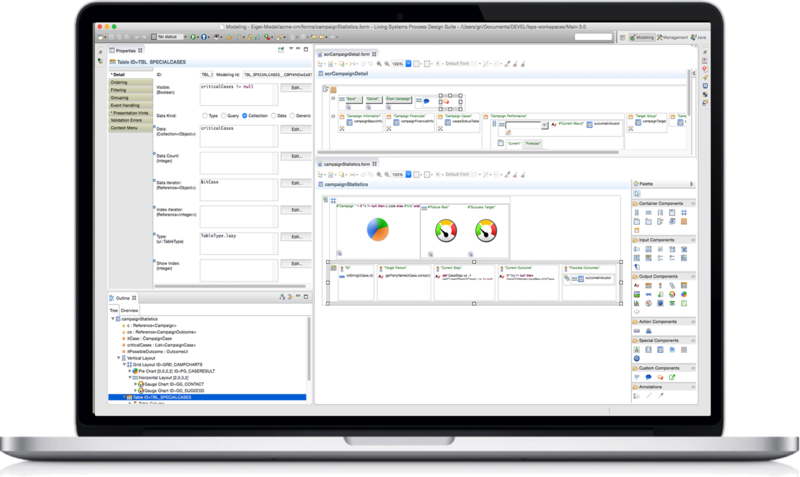 LSPS builds applications that combine process models based on Business Process Management Notation (BPMN) with a rich user interface, integrated Business Intelligence (BI), and robust management features that improve process execution. LSPS focuses on business outcomes to drive, track, and measure processes. Business outcomes are designed directly into the process model and are used to govern and monitor process performance at all times. This unique process modeling approach is achieved through the use of Goal-Oriented BPMN (GO-BPMN), a standards-compatible extension of the universally adopted BPMN notation. GO-BPMN enriches BPMN by separating policy from procedure: Goals describe what a process will do – its milestones and performance objectives – while activity plans describe how each goal may be achieved. Role-based access, process monitoring, notification and escalation, advanced business rules, and decision management all combine to reduce cost and improve performance across process areas. The ability to model optional BPMN flows permit the system to intelligently decide the path that most effectively achieves the desired outcome. Advanced discovery modeling tools help catalyze process and knowledge management, while application business rules and ad-hoc task management empower system administrators. Integrated dashboard views unify visibility of case, process, and performance data - delivered with a completely customizable end-user experience. LSPS includes an advanced, built-in data validation framework along with comprehensive process information and business data auditing services, providing full transparency and auditability. LSPS supports knowledge work for Adaptive Case Management (ACM) by linking data, events and rules within an outcome-focused environment. This is accomplished through the linking of structured and unstructured process inside a common framework. While many case management systems provide the means to collect, organize, and store data, to manage workflow, and to accommodate decision-making, this is often an expensive and non comprehensive approach. LSPS changes this status quo. Designed to easily assimilate into the existing infrastructure and connect to multiple data sources, LSPS provides a fully integrated case management without requiring a complete redesign and rebuild of entire systems. Instead, legacy systems remain intact, minimizing the necessary investment to bring a comprehensive case management system on board. Case-oriented processes are particularly well suited to goal-oriented design, as every case has a defined purpose and one or more work items that must be performed to complete the process. As work items and the particular methods to achieve them may not be defined in advance, the case process itself, or its owner, must determine when the purpose, or goal, has been reached. For example, a bank client-opening process will require compliance checks, but which checks are required and in which order will change over time according to the profile of the applicant. The goal remains the same, but the method can change for each instance of the process. LSPS Goals activate in parallel with the ability to select or suggest the plans to execute as the system and knowledge users navigate through processes. Cases are managed independent of process, with the intelligence to start, stop and navigate process activities based upon the data and events associated with a given case. Goal-based models are deployed to provide strategic guidance to all processes and cases managed by the system. Providing not only visibility at the macro level, LSPS intelligently manages the system to support the achievement of organizational strategic outcomes. Advanced data features control all aspects of case management, providing the ability to manage constraints, events, business rules, relationships among cases. Data-driven actions are activated to achieve desired outcomes. The LSPS Process Design Suite (PDS) is a robust development environment that offers all of the advantages of a flexible, custom application development platform, without the limitations and encumbrances of conventional, proprietary tools. The PDS is built on proven, standards-based technology with unparalleled community support that is used by analysts and developers all over the world, allowing for extremely fast prototyping and application generation. Data, Roles, Process, and user interface components are modeled using industry standard approaches, cutting development time and allowing collaboration with non-technical subject matter experts. Whether developing for desktop or mobile clients, dynamic themed designs and fluid application behavior support a rich, browser-agnostic end-user experience that aligns with corporate branding. Easily navigable and user-friendly environment. Highly modular architecture allows replacing, adjusting or extending server components, while compartmenting artifacts in an organized way. Configurable user controls and widgets provide an accelerated interactive approach to delivering high-impact end-user interfaces. Build and deploy your solutions faster, utilizing a complete set of standards-based development, testing and deployment tools. Quick-start tutorials and documentation provide guidance throughout the iterative development lifecycle. The PDS platform supports industry-recognized requirements, version control and issue tracking systems, including Agile and DevOps tools. Utilize simple, elegant LSPS language expressions and business logic to add custom behavior and support the seamless integration of external custom libraries and resources.